Last week, I revealed my basement office makeover, complete with a new desk created out of IKEA pieces. It’s the perfect place to take notes on projects, make lists to take to the hardware store, and sketch out new ideas. 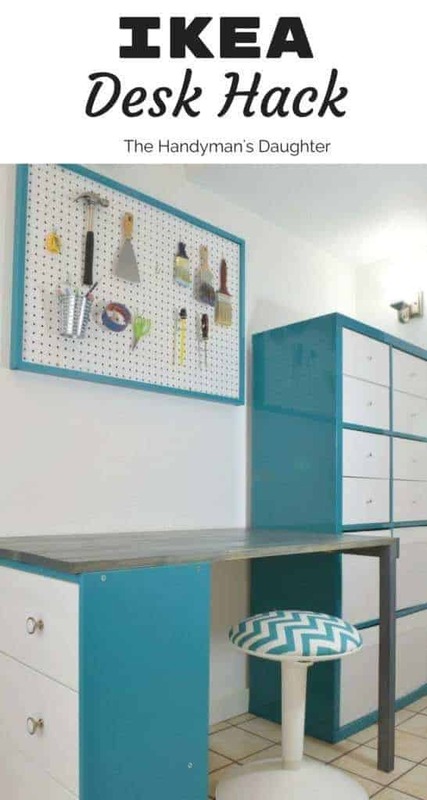 There’s also a ton of storage, thanks to the Kallax bins and Rast drawers. Today, I’m showing you how to pull off this easy IKEA desk hack yourself. This post contains affiliate links. For more information, please refer to my disclosures page. Start with the IKEA Kallax, formerly known as the Expedit. You can frequently find these shelving units on Craigslist or thrift stores cheap! Amazon also carries a variety of cube organizers and bins. Mine was collecting dust in my unused sewing room. 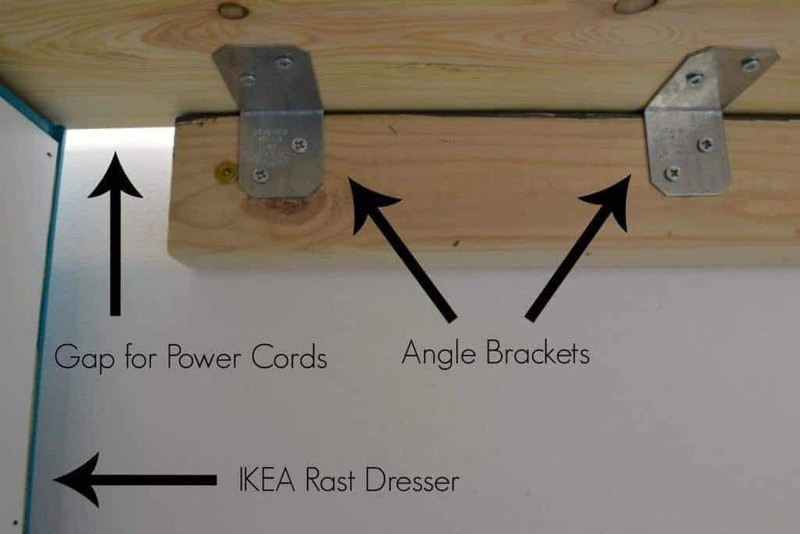 The main support for the desk is the IKEA Rast dresser. 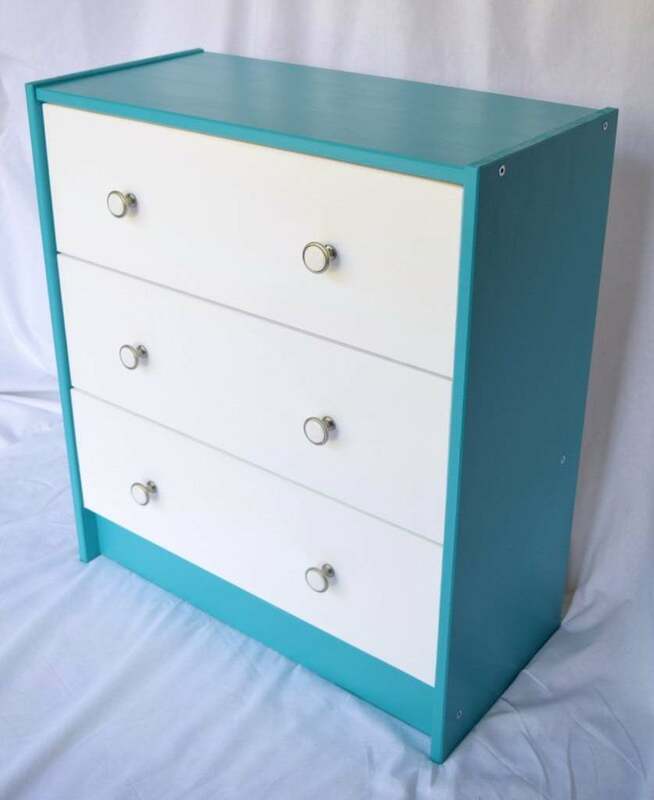 I painted mine to match the Kallax, which I discussed in detail here. 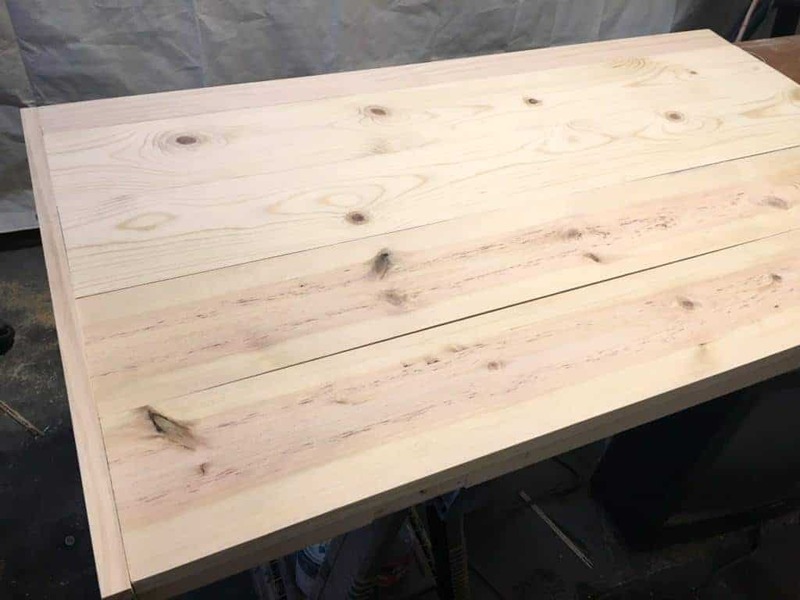 I planked the boards of my desk together, similar to the method I used on my updated outdoor storage bench lid. 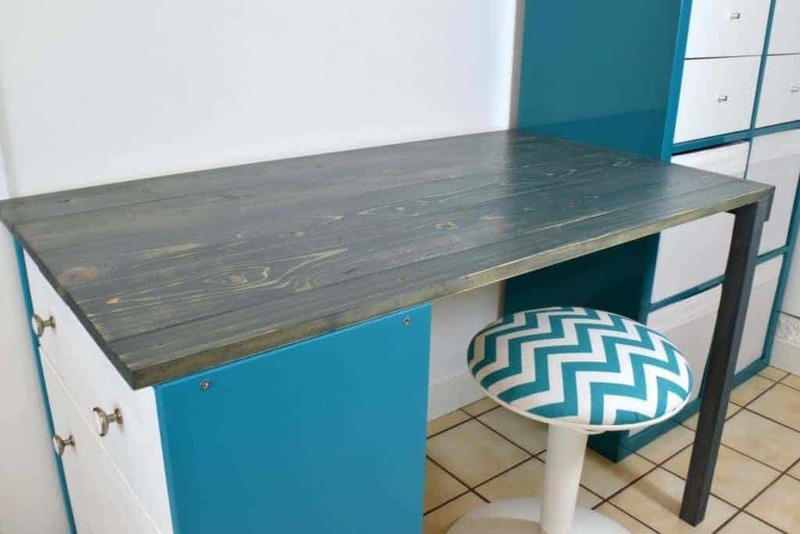 You could also use an IKEA tabletop or even a narrow hollow core door for this IKEA desk hack! 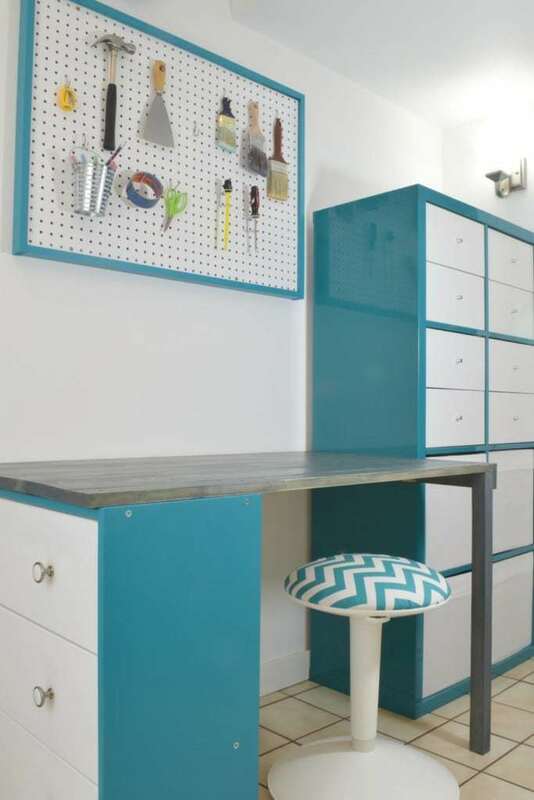 Determine how long you want your desk to be, including the Rast dresser (which is 11 3/4″ deep). Subtract 3/4″ from that dimension, and cut four 1 x 6 boards and one 1 x 3 board to that length. My desk is 43 3/4″ long, so I cut my boards to 43″. Mark where you will place the pocket holes, then drill them using a Kreg Jig. The K5 makes this super easy, but the inexpensive R3 works just fine. Drill two pocket holes at one end of each board as well. 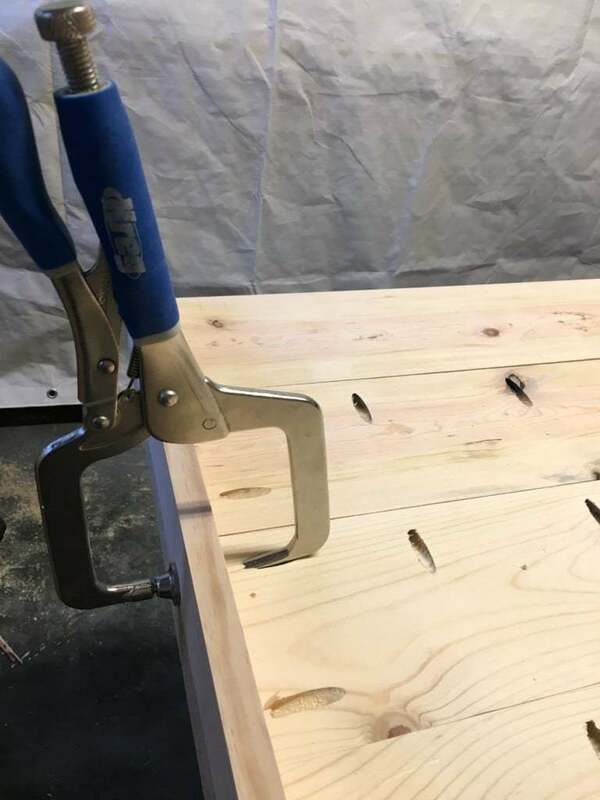 Clamp the boards at each end, then screw them together with 1 1/4″ pocket hole screws. Cut the leftover piece of 1 x 3 board to 24 1/2″ (the width of all the boards planked together). Attach this piece to the end of the planked boards, making sure that the top is flush with the surface. Sand down your newly built desk top, then use a tack cloth to remove all the dust. 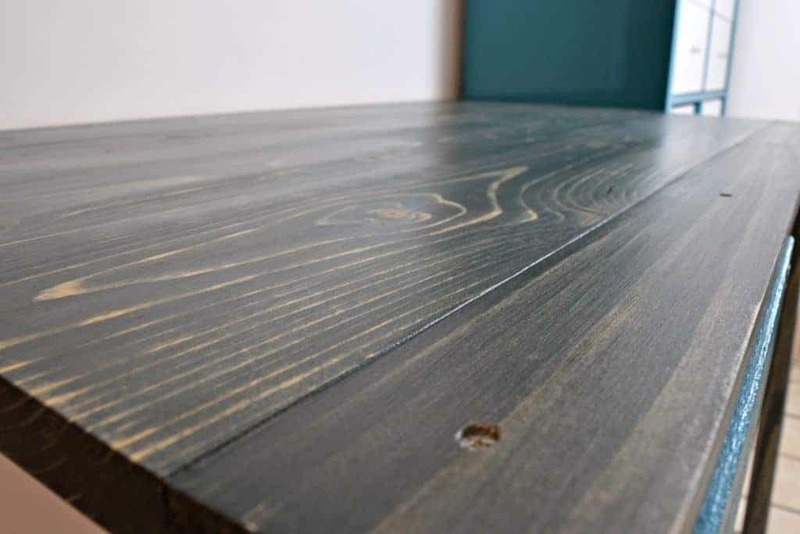 I stained my desk top with Minwax stain in Charcoal. It wasn’t my favorite stain (it goes on very paint-like), which is why it’s been sitting unused in my workshop for a while. I wanted a dark gray stain to balance out all that white and bright blue, so I decided to give it another chance. Cut a scrap piece of 2 x 4 a few inches smaller than the distance between the Rast and Kallax. 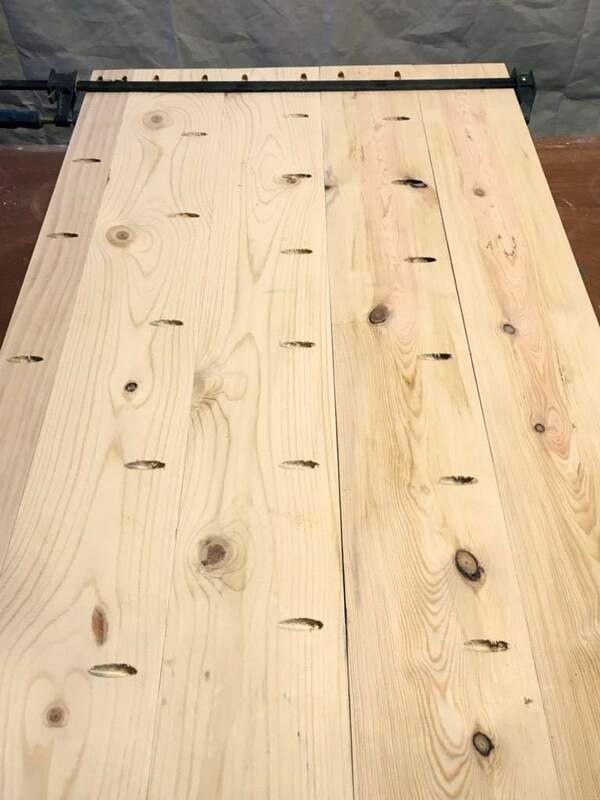 This piece will attach directly to the wall at the studs with 3″ screws, and will serve as support for the back of the desk. 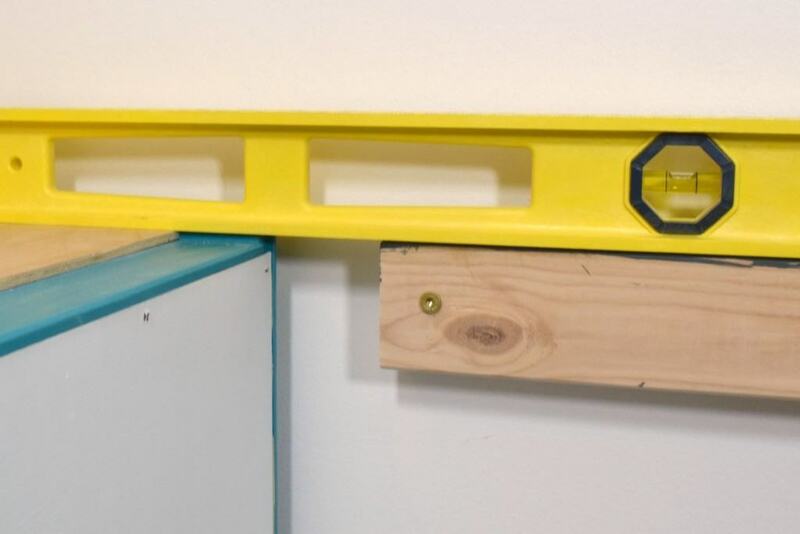 Use a level to make sure it is even with the top of the Rast dresser. Leave at least 3/4″ of space on the Kallax side for the desk top lip, and a couple inches on the other side for power cords to slip through. My 2 x 4 is about 28 inches long. 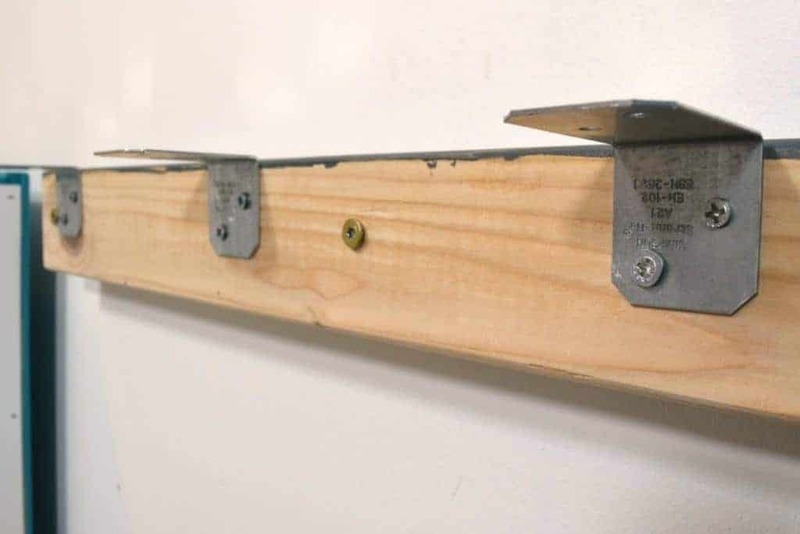 Attach four Simpson Strong-Tie angle brackets to the top edge of the 2 x 4 using 5/8″ screws. These brackets will keep the desk top in place and provide more support. Now set the desk top across the brackets and Rast dresser, with the lip facing towards the Kallax. 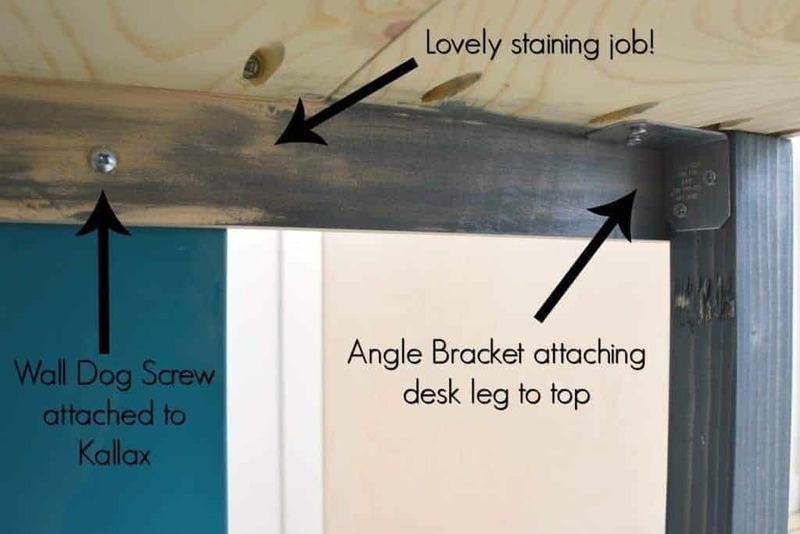 Attach the other side of the angle brackets to the underside of the desk top using 5/8″ screws. To connect the Rast to the desk, I just screwed straight through the top with a few 1 1/4″ screws. Attach the lip of the desk top to the side of the Kallax with Wall Dog screws. Wall dogs are anchors and screws in one, which will grip into the particleboard sides of the Kallax securely. I love using these screws anytime I need to attach something to drywall without a stud, too! I thought the free hanging corner of the desk looked a bit odd, so I cut a 2 x 2 leg to fit. The leg is totally optional, since the desk is pretty secure at this point. It’s attached to the desk top with another Simpson Strong-Tie angle bracket. Ta da! 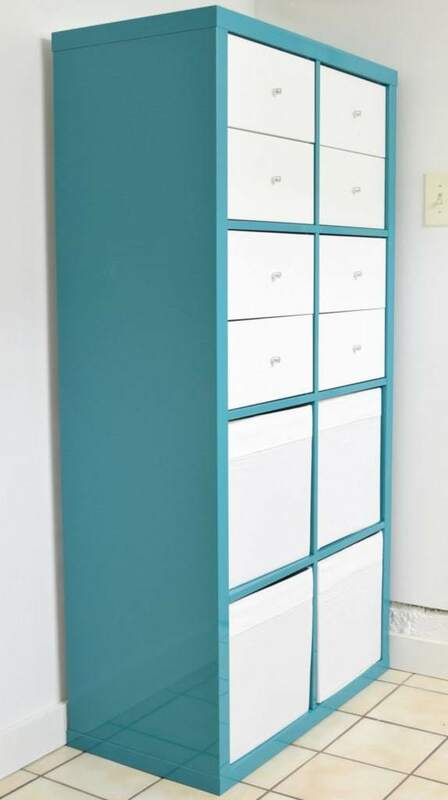 A simple IKEA desk hack using a Rast dresser and Kallax storage unit! This desk is actually more sturdy than the Crate and Barrel one I’m replacing, and looks better too. You can’t beat the storage either. If you would like to keep up to date with my latest posts about woodworking, home decor and more, you can follow me on Facebook, Pinterest, or sign up for my weekly newsletter below. Brilliant, looks great and SO much storage. A really nice work space and creative desk although over my head when it comes to the diy side of things. I really think you make an amazing workspace! Love the colors & how this turned out! Thanks for sharing at the #InspirationSpotlight Pinned & shared. This is gorgeous! Love the colors you chose too! Thank you so much for sharing with us at our To Grandma’s house we go link party! Pinned!